The Okinotorishima (沖ノ鳥島, Okinotori-shima) is a coral reef with two rocks enlarged with tetrapod-cement structures. It is claimed by Japan with a total shoal area of 8,482 m2 (2.096 acres) and land area 9.44 square metres (101.6 sq ft). Its dry land area is mostly made up by three concrete encasings and there is a 100 by 50 m (330 by 160 ft) stilt platform in the lagoon housing a research station. There is a third complete artificial tetrapod-cement islet. It is located on the Palau–Kyushu Ridge in the Philippine Sea, 534 km (332 mi) southeast of Okidaitōjima and 567 km (352 mi) west-southwest of South Iwo Jima in the Bonin Islands or 1,740 km (1,080 mi) south of Tokyo, Japan. The atoll is the southernmost part of Japan and the only Japanese territory in the tropics. Japan claims the atoll is significant enough for Japan to have a 200 nautical mile (370.4 km) exclusive economic zone (EEZ) around the atoll, but China, South Korea, and Taiwan dispute the Japanese EEZ, saying that the atoll does not meet the definition of an island under the United Nations Convention on the Law of the Sea. The English meaning of the name is "remote bird islands". The atoll has multiple designations in English (Okinotori coral reefs, Okinotori Islands). Its original name was Parece Vela, Spanish for "it looks like a sail" (alluding to the original appearance of the reef). This name has been retained in English as well, especially to designate the geological formations of the islets. It was possibly first sighted by the Spanish sailor Bernardo de la Torre in 1543, certainly by Miguel López de Legazpi in 1565, and its first recorded name was Parece Vela ("looks like a sail" in Spanish). In 1789, William Douglas arrived with the British ship Iphigenia and, in 1790, the place was named Douglas Reef (also spelled Douglass Reef). The existence of the atoll might not have been known by the Japanese until 1888. In 1922 and 1925, the Japanese navy ship Manshu investigated the area. In 1931, confirming that no other countries had claimed the reefs, Japan declared it Japanese territory, placing it under the jurisdiction of the Tokyo Metropolis, classifying it as part of the Ogasawara Village, and naming it Okinotorishima. During 1939 and 1941, a foundation was completed for "a lighthouse and a meteorological observation site" but construction was interrupted by the outbreak of World War II. After Japan's defeat, the United States assumed sovereignty over the Ogasawara islands, and returned authority over the islands to Japan in 1968. Japan will concur in any proposal of the United States to the United Nations to place under its trusteeship system, with the United States as the sole administering authority, Nansei Shoto south of 29° north latitude (including the Ryukyu Islands and the Daito Islands), Nanpo Shoto south of Sofu Gan (including the Bonin Islands, Rosario Island and the Volcano Islands) and Parece Vela and Marcus Island. 1. With respect to Nanpo Shoto and other islands, as defined in paragraph 2 below, the United States of America relinquishes in favor of Japan all rights and interests under Article 3 of the Treaty of Peace with Japan signed at the city of San Francisco on September 8, 1951, effective as of the date of entry into force of this Agreement. Japan, as of such date, assumes full responsibility and authority for the exercise of all and any powers of administration, legislation and jurisdiction over the territory and inhabitants of the said islands. 2. For the purpose of this Agreement, the term "Nanpo Shoto and other islands" means Nanpo Shoto south of Sofu Gan (including the Bonin islands, Rasairo Island, and the Volcano Islands) and Parece Vela and Marcus Island, including their territorial waters. Between 1987 and 1993 the government of Tokyo and later the central government built steel breakwaters and concrete walls to stop the erosion of Okinotorishima, which today leaves only three of the five rocks that were present in 1939 above water; in 1988 the Japan Marine Science and Technology Center built a marine investigation facility which it has since maintained following typhoon damage. Funding for full repairs was finally allocated in early 2016. The facility also doubles as an EEZ observation post for the Maritime Bureau of the Ministry of Land, Infrastructure, Transport and Tourism, being equipped with radar and various other sensors to help monitor activity in the zone. On March 16, 2007, a light beacon was installed by the Japan Coast Guard. The beacon is plotted on the hydrographic chart. Geologically, the islets are a coral atoll, built on the Kyushu–Palau Ridge, the westernmost part of the Izu–Bonin–Mariana Arc system. The name "Parece Vela" has been given to the extinct back-arc basin that lies immediately to the east (the northern half of this back-arc basin is known as the Shikoku Basin). This back-arc basin was formed by seafloor spreading between the late Oligocene and Miocene. The Parece Vela Basin contains the longest megamullion in the world. The original Spanish name of the islets is normally used for the geological formations, hence, Parece Vela megamullion, Parece Vela ridge, Parece Vela rift or Parece Vela basin. The waters around the reefs are potentially rich in oil and other mineral and fisheries resources and it lies in an area of potential military significance. At high tide, one area of the reefs is 1.58 square meters (17.0 sq ft), roughly the size of a twin bed, and pokes just 7.4 centimetres (2.9 in) out of the ocean. The other is 7.86 square metres (84.6 sq ft), the size of a small bedroom, and rises 16 centimetres (6.3 in), about twice as high. The entire reef consists of approximately 7.8 square kilometers (3.0 sq mi), most of which is submerged even at low tide. Kita-Kojima (北小島, "Northern Islet"), nevertheless rather in the "West"
Minami-Kojima is a completely artificial islet created in shallow water. But also the two original islets appear completely artificial today, with little if any trace of the two natural rocks that still appear on photographs of 1987. In 1925, there were still five above-water rocks, which have eroded since. A report from 1947 mentions five above-water rocks. Three smaller ones were on the west side, nearly impossible to see from seaward because of the breaking waves. The larger rocks on the southwest side and on the northeast side, possibly Kita-Kojima and Higashi-Kojima, were reported to be 0.6 and 0.4 m (24 and 16 in) high, respectively. The original rocks appeared barren, obviously without any terrestrial vegetation. The current artificial dry land areas with their concrete surfaces appear unfit to support terrestrial vegetation either. After concrete encasing, each of the islets appears as a circle with a diameter of 60 meters (196 ft) on detailed satellite images, which would correspond to a land area—albeit mostly artificial—of 2,827 m2 (0.699 acres) per islet, or 8,482 m2 (2.096 acres) in total. In addition, there is a platform on stilts in the shallow part of the lagoon 140 metres (460 ft) east-northeast of the southern islet, built by the Japan Marine Science and Technology Center in 1988, which appears as a rectangle of 100 by 50 m (330 by 160 ft). The platform has a helicopter landing pad and a large three-story building with a marine investigation facility and a meteorological station. The rocks are in the western part of a lagoon surrounded by a submerged coral reef, over which the waves break, and that extends 4.5 km (2.8 mi) east-west and 1.7 km (1.1 mi) north-south, with an area of roughly 5 km² within the rim of the reef. The lagoon is 3 to 4.6 meters deep, but there are numerous coral heads of lesser depths throughout the area. The fringing reef of the atoll is pear-shaped in an east-west direction with its greatest width at the eastern end. There is a small boat channel into the lagoon in the southwest, about 15 meters (49 ft) wide and 6 meters (20 ft) deep, 250 meters (820 ft) southeast of the artificial islet. Administratively, the island is considered part of Ogasawara village, Tokyo. In 1939, the construction of a naval base was started by Japan, but suspended in 1941, at the start of the Pacific War. Typhoons are constant threats to Okinotori's existence. In the 1970s there were about five or six visible protrusions, but by 1989, only two were visible. In order to prevent the island from submersion caused by erosion and maintain its claim to the EEZ, the Japanese government launched an embankment building project in 1987, and Higashikojima and Kitakojima were surrounded by concrete. Japan has encased the reefs with $280 million worth of concrete and covered the smaller one with a $50 million titanium net to shield it from debris thrown up by the ocean's waves. 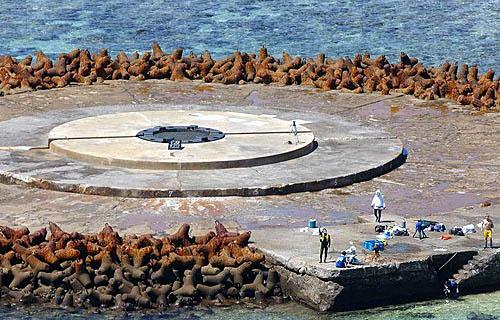 The Japanese government has spent over $600 million fortifying the reefs to prevent them from being completely washed away. Furthermore, the Nippon Foundation has drawn plans to build a lighthouse and increase the size of the reef by breeding microorganisms known as foraminifera. Creating land using the microorganisms could take decades to a century before the island is large enough to be useful. Currently, Japan carries out maritime research and observation of the area, as well as repair work on the embankment. In 2005, the government installed a radar system (at the cost of ¥ 330 million), repaired a heliport, and placed an official address plaque saying, "1 Okinotori Island, Ogasawara Village, Tokyo" in Japanese. Fishing expeditions also support the claim of economic activity. Former Tokyo Governor Shintaro Ishihara has talked of building a power station, despite protests by environmentalists. His government has helped fund expeditions to Okinotori by Japanese fishermen and scientists. Governor Ishihara himself toured the islands on May 20, 2005 to inspect the conservation and management efforts, went snorkeling to see firsthand the condition of the surrounding waters, and released Japanese horse mackerel fry to show support for the local fishing industry. The islands are an intermittent rallying point for Japanese nationalists, and, as such, a hot-button political issue in Japan. On 22 April 2004, Chinese diplomats stated during bilateral talks with Japan that they regarded Okinotorishima as an atoll, not an islet, and did not acknowledge Japan's claim to an exclusive economic zone (EEZ) stemming from Okinotorishima. Under the United Nations Convention on the Law of the Sea, an island is "a naturally formed area of land, surrounded by water, which is above water at high tide". It states that "rocks which cannot sustain human habitation or economic life of their own shall have no exclusive economic zone." Japan signed the Convention in 1983; the Convention came into force in 1994–1996 for Japan. Japan claims an EEZ over 400,000 square km (154,500 square miles) around Okinotorishima. China and South Korea dispute this claim in their addenda to the CLCS, saying the area only consists of rocks and not islands. Neither China nor South Korea have territorial claims regarding Okinotorishima, but foreign policy analysts speculated that it wants to "investigate the surrounding seabed for submarine operations in case of military conflict involving the Republic of China (Taiwan)." Japan claims that rock is not defined in the Convention. Besides, the construction of port, lighthouse and power station may be used as a counterargument for PRC's claim regarding "sustain human habitation or economic life". The territory lies at a militarily strategic point, midway between Taiwan and Guam, the latter where U.S. forces are based. Vessels of the PRC are believed to have been mapping the ocean's bottom over which U.S. warships might pass on their way to Taiwan. The PRC conducted four maritime surveys near the Okinotori coral reefs in 2001, two in 2002, and one in 2003. However, the number of such incidents rose to four in 2004. These incidents have drawn protests from Japan. Jon Van Dyke, a law professor, has suggested that the situation is similar to the failed British attempt to claim an EEZ around Rockall, an uninhabited granite outcropping in the Atlantic Ocean. The UK eventually dropped its claim in the 1990s when other countries objected. Dr. Dyke has further asserted that it is impossible to make "a plausible claim that Okinotorishima should be able to generate a 200 [nautical]-mile zone". Tadao Kuribayashi, another law professor, disagrees, arguing in part that rocks and reefs differ in composition and structure, and that the intent of the provision was geared toward the former. In 2016, Japan's arrest of a Taiwanese fishing ship's crew led Taiwan to protest against Japan's claim of island status for Okinotori and by extension the EEZ. ^ "世界一小さな島　沖ノ鳥島". www.theeleventhhouronline.com. Retrieved 11 December 2018. ^ a b c d e f g h i j k Yukie Yoshikawa. 2005. "Okinotorishima: Just the Tip of the Iceberg". Harvard Asian Quarterly, Vol. 9, No. 4. ^ Onishi, Norimitsu. "Japan and China Dispute a Pacific Islet", The New York Times. July 10, 2005. ^ a b c d Martin Fackler. 2005, February 16. "A Reef or a Rock? Question Puts Japan in a Hard Place To Claim Disputed Waters, Charity Tries to Find Use For Okinotori Shima" The Wall Street Journal. p. A1. ^ McCurry, Justin (2016-02-03). "Japan to spend millions on tiny islands 1,000 miles south of Tokyo". The Guardian. ISSN 0261-3077. Retrieved 2017-04-27. ^ Martin Fackler. 2005, February 20. "Japan's ultranationalists: Stuck between a rock and a hard sell"
^ "Japan hopes to build lighthouse on atoll disputed with China". Xinhua. August 25, 2005. ^ "Beijing is getting a bad rap in South China Sea disputes". The Japan Times. 2015-06-17. ^ Campion, Gilles, "Remote rocks at center of dispute", The Japan Times, AFP-JiJi, March 13, 2010, p. 3. ^ "An islet the size of your bedroom has Japan and Taiwan fighting". Los Angeles Times. Wikimedia Commons has media related to Okinotorishima.